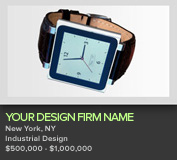 How much does it cost to join and list my design firm? Basic listings are free. Premium account listings are $85USD per month. If you need more, contact us to talk about PremiumPlus. How can I get my listing to appear on the home page? Firms with PremiumPlus Listings receive placement on the DesignDirectory home page, as well as on Core77.com pages. New Projects by Premium firms are also showcased on the home page. How can I get my projects published at Core77.com? 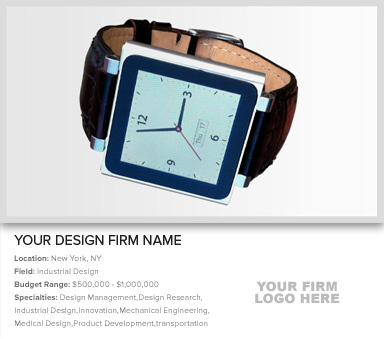 Projects published by firms with Premium Listings automatically appear in a special Firm Projects showcase at Core77.com. The Core77 editors regularly review these projects looking for materials and stories to feature. Talk to us about how to get your company appearing throughout the pages at Core77 with a PremiumPlus subscription.